Sound of immense proportions fills the entire amphitheater, instantly masking the distributed racket of a sellout 20,000-strong crowd. Batteries of lights irradiate everything from the exuberant faces of my new short-term neighbors to the jagged internal structure of the hockey arena, which, illuminated, looked as though it had been constructed using a giant child’s Meccano set. As my eyes and ears regulate, squinting through the layers of light the origin of the sound and light show becomes clear: three unassuming older dudes on stage with a guitar, bass and a drum kit. 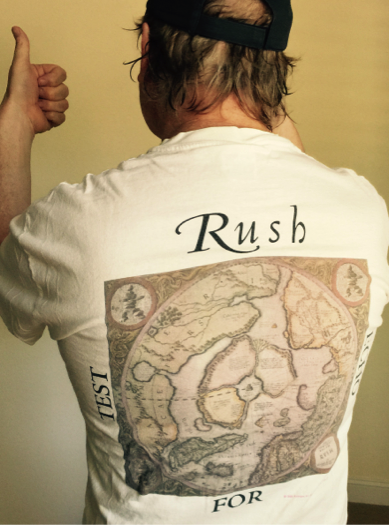 For three unassuming guys from Canada, Rush is known to be big, visually and aurally, and tonight, perhaps their final tour, is no exception. When Rush first appeared on the Scottish rock music scene in the late 1970s, my teenage group of friends’ comparative assessment was limited to our meager assemblage of vinyl LPs, two one-hour radio shows per week, and our detailed dissection of a handful of music newspapers. 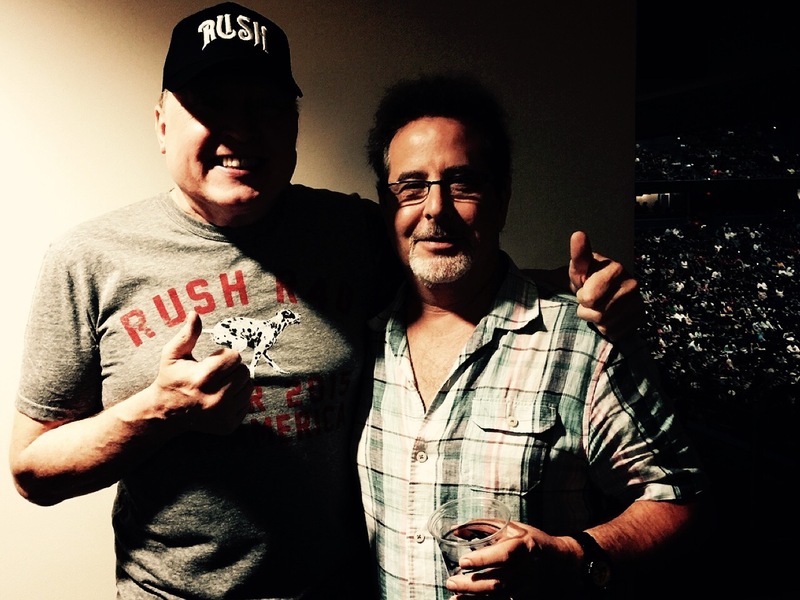 We compared Rush to other established contemporaries for various musical traits. Back then, new potentially awesome bands would be discovered and announced excitedly by one of our friends in a manner similar to what you might expect at a Paul Revere re-enactment in Boston. Musical comparisons were very important for the younger generation, then as now, as it was an intrinsic means of social communication. Now of course, it is different: more automated, more technology-driven and real time, and more media savvy. For example, today Pandora uses a patented method called the “music genome” which decomposes songs into various ingredients and compares all the constituent parts of artists’ offerings in order to determine the essence of similarity. Although I believe there is a human-in-the-loop at the company, Pandora generally uses automation to come up with a sequence of songs by different artists that an individual ought to like based on selection of favorite band or bands. And boy is Pandora spot on. When I selected Rush radio recently I was treated to an ensuing amalgamation of Black Sabbath, Van Halen and Deep Purple. Amazing—the other three performers we had ready to play back in 1977! I’m just left thinking I could’ve lined up those other songs myself instead of relying upon thirty-some years of advanced technological development. 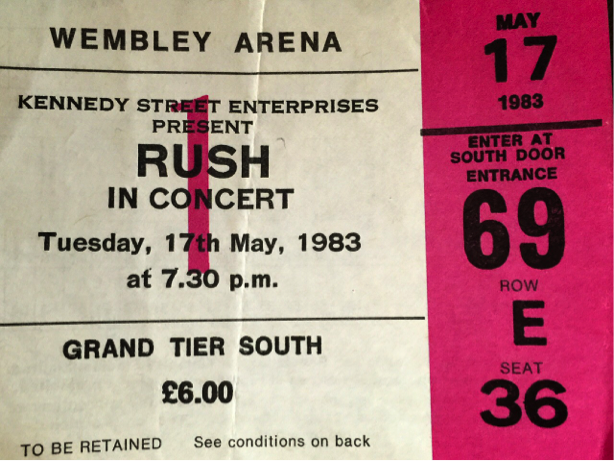 I loved listening to Rush in the 70s but maybe even more in the early 80s with the release of Signals and Grace Under Pressure. Many of my die-hard rock friends made opinionated distinctions about the 70s Rush and the 80s Rush as if the band had sold out by having more synthesizer dependence and trying to be a bit more pop-like and mainstream than the introspective Caress of Steel or the phantasmagorical 2112 albums. Geddy Lee’s voice was certainly strange in the earlier days with the ultra high-pitched vocal, which is not as noticeably present today. But that’s not necessarily a Rush highlight; it was never about the singing. Nor was it about the lyrics—you can love or hate Neil Peart’s scribblings, but he did put a lot of thought into them, and why shouldn’t there be songs about snow dogs and necromancers? It is all about the collective sound—the band. While all three are excellent musicians, together they are fabulous, a musical definition of synergy. You could pick three arguably more accomplished individual musicians who achieve less together, for example, Bozzio, Levin and Stevens, whom I admire greatly. 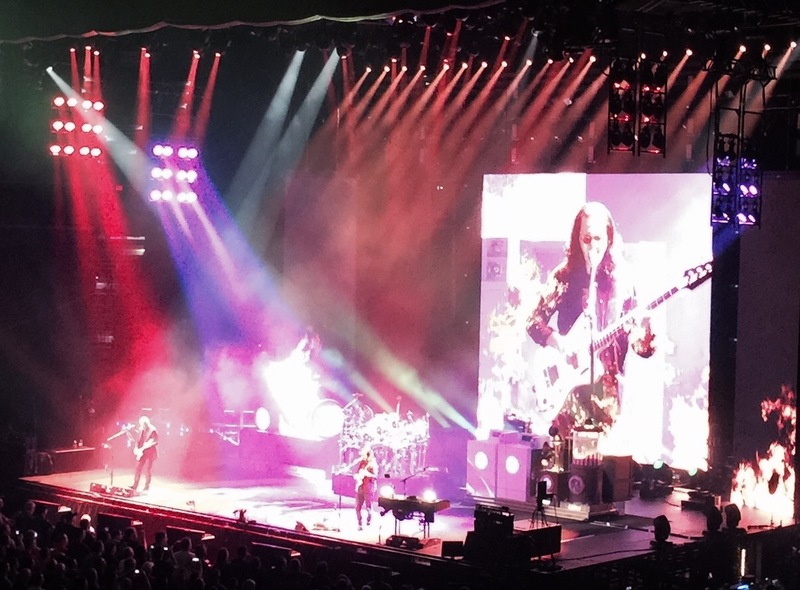 It’s great to see and hear Rush live; they play and look great and although their performances rely on heaps of technology they can essentially pull off all the songs including those that are difficult or otherwise complicated. However, generally I am not a fan of live albums and Rush seems to have gone over the top a bit in that department, like many other aging bands, with so many recordings to choose from, such as Live in Rio, Live Just the Other Night, and Live Again. I made some of those up, but my point is that the live shows are great to attend in real time; however, if I want to really listen to songs I want the original studio versions that were painstakingly mixed, mastered and produced so that fans like me can bask in every note, nuance and rhythmic refinement. Nonetheless, my preference for studio recordings does not necessarily extend to remixes. A higher quality version of an original is one thing, but changing the mix or providing alternative takes of songs after a musical lifetime I find strangely unsettling. Recently, I played Jimmy Page’s alternative productions of Led Zeppelin classics and I couldn’t help but feel somewhat perplexed, as I might should my Scottish mother suddenly start talking with a Bavarian accent. Furthermore, while I love being a vital but teeny part of enthusiastic audience participation on show-night, subsequently listening to recordings of hollering drunken hordes such as those on Frampton’s Baby I Love Your Way is not something I view as a positive. Occasionally I have to listen involuntary to comparable live ballads on my car’s satellite radio with great sadness as I realize that many of these grandparents don’t go to concerts anymore. But that’s partly my fault for creating demand by tuning into 70s channels such as Classic Rock, Classic Rewind, 70s on 7 and so on. Caught by a TV interviewer on a street corner with the cameras rolling and the portable lights reflecting in the big silver golf umbrella I would probably admit, rather rapidly, that the 70s represents the pinnacle in rock music. But I lament being stuck there. I do sometimes ask myself how many times in a month or a year should we have to listen to such classics as Bohemian Rhapsody or Stairway to Heaven. I hear them more repeatedly than the UK National Anthem, although not more often the old U.S. Stars and Stripes, since I am a sports fan in that country. I can imagine in a parallel life that as a young man I would have been thrilled to bits to land a good paying job as a disc jockey, especially if it was 70s music. Four decades later I think that might qualify as one form of cruelty in Dante’s Inferno. Today, music for me continues to be a necessity and vital pleasure and not some form of torment. Torture by music is perhaps playing full-volume thrash heavy metal at blindfolded secluded prisoners in recent desert campaigns, as depicted in some movies and newspaper stories. Perhaps the closest I come to sonata suffering is through overexposure to background music. My wife and others habitually tut tut or give me some expression of chastisement as I request that unwanted, piped music, or muzak, be turned down or switched off in taxis and restaurants all over the world. Sometimes I’m the only customer and knowing the ambience is intended solely for me I’ll politely ask for its prompt cessation. In deepest Asia I explicitly tip for silence, as those songs kill me at any volume, especially when I’m hopelessly stuck in traffic. One time, I was stuck in a huge snowstorm at 6 AM going to the Boryspil International Airport in Kiev and the driver, with great fanfare, proudly produced a CD of ABBA’s greatest hits. In a Blizzard, before the light of day, if my flight isn’t canceled I’ll probably miss it anyway and some guy thinks I want to relax and groove to Dancing Queen. More recently in Manila, I arrived at the Ninoy Aquino Airport and was treated to unwanted muzak piped through the terminal, car, hotel lobby, elevator, and down the long hallway into my room, where tunes emanated from the large-screen TV. Since I stopped drinking Scotch a while back, oxygen or sunlight is the only commodity I yearn for continuously in such quantities. Those cunning Canadians designed their R40 show to start from most recent all the way back to their debut album, while roadies continuously deconstruct the set from lavish to basic, taking us through a series of stages as if from a stadium to a club. Yet tonight I’m in a private suite watching one of my all-time favorite bands and all the songs spanning a 40-year history are sounding great. Every guitar riff, bass thump and symbol crash of their three-hour, 30-song set has my complete attention and tomorrow I’ll tweet my old high school friends back in Scotland to wallow in the afterglow. 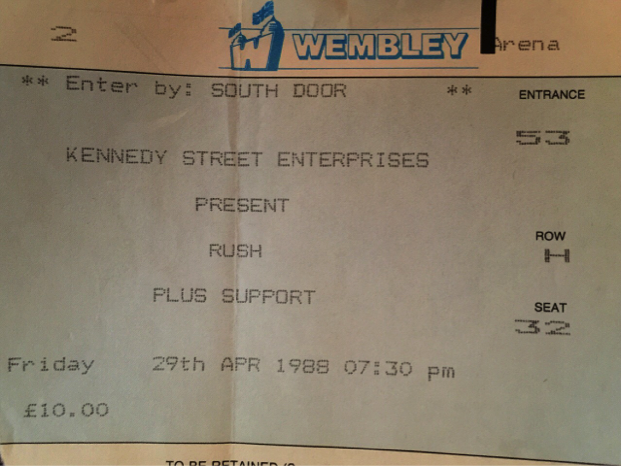 Hopefully, this is not the last time I’ll get to see Rush exit stage left. You meet many ardent supporters on Rush tours. These two guys say they’ve been following the band, going to all the tours since the 1977 Farewell to Kings tour, yet the guy on the right still hasn’t decided when he’ll get his first tee shirt.